With 92 exhibitors per year and only a decade-long history, the Dallas Art Fair isn’t the grandest stop on the international art market circuit. But its 10th annual edition, which ends Sunday, showed how an increasingly prominent network of public institutions and private collections have turned the fair into a Texas institution, and an important fair for the country. The fair has been able to capitalize on the historic synergy between the city’s museums and their board members, which gives Dallas its art market firepower. Last year, it attracted nearly 15,000 attendees, putting it within spitting distance of much older fairs such as Art Brussels—and can see its exhibitors sell works within the mid-six-figure range. The collectors are also of a caliber that galleries feel comfortable bringing work for up to seven figures. Tim Van Laere Gallery from Antwerp shipped over Franz West’s gigantic sculpture Lemur (2009), for sale for €935,000 ($1.15 million), and Madrid’s Galeria Javier Lopez & Fer Frances, brought Alex Katz’s gigantic Vivien, priced at $1 million. Additional works sold for prices in the mid-six-figure range—respectable for any fair in the country, not just Dallas. At Paul Kasmin Gallery, from New York, Milton Avery’s Adolescents by the Sea (1947) sold for $375,000, and Lee Krasner’s Water No. 18, a gouache on paper work from 1969, sold for $225,000. Representatives from the gallery, which participated the fair for the first time, said they weren’t expecting to sell work at that price point, and from that time period, so early in the week. Gleason’s first impression of the Dallas clientele? He said he was pretty wowed. The fair gets support from the city government, too. Dallas mayor Mike Rawlings addressed journalists, exhibitors, and a few enthusiastic collectors at Thursday morning’s press conference, wearing an “I [HEART] ART” pin on his lapel. He told people in the crowd they were currently standing in “the largest contiguous arts district in the country” while sneaking in a plug for his city’s airport, an international travel hub. “You would typically have to get on one of our nonstops to Hong Kong or London or Dubai to see art of this caliber, but now it comes to us,” Rawlings said. He ended his pep talk with a sentiment not lost on those in this well-heeled oil town: “Go out and spend money!” he said. Some funds had already been parted with before the floodgates even opened. In 2016, the Dallas Museum of Art (DMA) announced that it had established an acquisitions program that would be used to buy works from the fair for its permanent collection, funded to the tune of $50,000. The fund has grown each year, and is now $150,000, which was used to buy works by Brie Ruais, Sanford Biggers, Matthew Ronay, Tony Lewis, Geraldo de Barros, Shara Hughes, and Alicia Henry. The DMA’s purchases signal just one of the many ways that the local arts community rallies around the fair every April: Dallas Contemporaryopened a giant show of work by Eric Fischl, the Power Station has an installation up by Adam Gordon, and the DMA has on view the retrospective of work by Laura Owens that traveled from the Whitney Museum of American Art in New York and will continue on to the Museum of Contemporary Art, Los Angeles. Collectors who sit on the boards of those museums could be seen in full force at the early preview of the fair, and then again at the gala event that evening. What’s more, a number of the city’s more prominent collectors graciously open their homes and private museums to visitors. Some had tours of the home of Marguerite Hoffman, who with her late husband, Robert, built up a trove of works by Cy Twombly, Jasper Johns, and Mark Rothko. The Karpidas Collection—which the English collector Pauline Karpidas moved from Hydra, the island in Greece, to Dallas in 2015—was open Thursday, and let visitors revel in work by John Currin, George Condo, Richard Prince, and others. On Saturday, visitors went to the Warehouse, the exhibition space built by Howard Rachofsky to store his vast holdings of contemporary art that kickstarted the city’s collecting mania. And the way the fair plays matchmaker between these collectors and fair exhibitors helps ensure galleries sell enough works to make a profit, encouraging them to come back the following year. “The fair really does a lot of effort in making sure the galleries are happy, and they went out of their way to introduce me to a lot of great collectors in the city,” said James Shaeffer, director at Simon Lee Gallery’s New York space. He added that the tight-knit nature of the collector base in Dallas helped spread the word about his booth, which featured new work by Claudio Parmiggiani. He added that it was the gallery’s second year at the fair, and they had sold several works by Parmiggiani, including a few made specifically for Dallas. Two works involving taxidermied butterflies sold for €40,000 (roughly $49,300), and a work that incorporates soot on canvas, covered by a unique plexiglass case, sold for €65,000 (nearly $80,200). Galerie Perrotin has recently been making a big push in Asia, having announced that its fourth space on the continent would be opening in Shanghai in September. But it still prioritized coming to Dallas, where they have shown for the past four years, partially because of the ties it has with local institutions, including some businesses. For instance, Perrotin artist Paola Pivi had a solo show at Dallas Contemporary in 2016. And last year, the tony bistro Bullion opened in 400 Record, a downtown building stuffed with art from the collection of Thomas Hartland-Mackie, the building’s developer, with the selection of works curated by the New York-based advisor Benjamin Godsill. As one goes up Bullion’s flashy golden spiral staircase—no one’s ever accused Dallas of subtlety—a baubled metal two-story sculpture by Perrotin artist Jean-Michel Othoniel runs through the center of the staircase spiral up toward the ceiling. Peggy Leboeuf, an executive director at the gallery, said another Perrotin artist, Daniel Arsham, had a public art commission in the Design District, which helped raise awareness of the gallery’s program. She said the gallery sold a work by Pivi for $68,250, a work by Josh Sperling for $22,000, a Mel Ziegler for $15,000. And according to Leboeuf, the fair has changed since Perrotin first jumped onboard, as it’s become more international, with more foreign galleries each year. 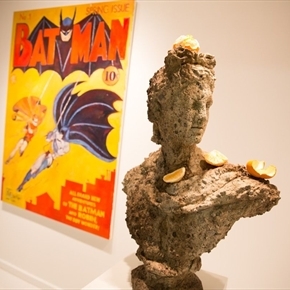 At the booth of New York and London gallery Marlborough Contemporary, director Pascal Spengemann said he had sold one of Keith Mayerson’s Batman and Robin canvases to, curiously, a collector of Batman paraphernalia. The price tag was $35,000. “We’ve brought Alex Katz before, two years ago, and this time we decided to bring a masterpiece,” he said. And by Saturday, Tim Van Laere had not yet sold the Franz West work, but the gallery’s namesake owner said he had no regrets about bringing it. But only half of the booth was his—to cut costs, he was splitting it with Workplace, a gallery in London and Gateshead, a town in northern England. On Friday, Mayor Rawlings beelined to And Now to seek out work by one artist who he had a special connection with: Michelle Rawlings, his daughter, who had a solo show at And Now last year, and had a painting in a group show at the space this past January. When Rawlings asked Cope about the work on view, the dealer had to inform the mayor that it had already sold—another great sign for the growing Dallas art scene that he champions as mayor, but a disappointment for him as the artist’s dad.